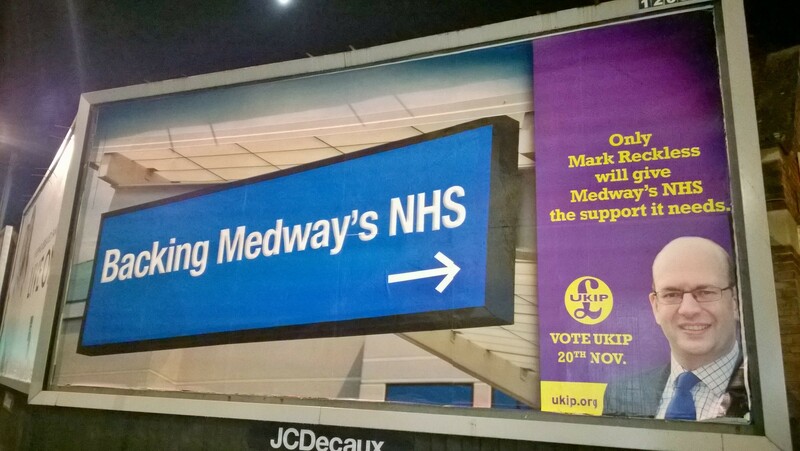 This entry was posted in nhs and tagged conservatives, Health, Kent, mark reckless, Medway, NHS, politics, rochester and strood, UKIP. Bookmark the permalink. Both my wife and myself have had reason to use the services of the Medway Maritime Hospital recently. Cannot fault the attention given by the front-line staff. The management is something else altogether. The hospital appears to operate as lots of different separate departments, with no joined-up thinking. A cohesive strategy is needed. Also it appears swamped under a morass of paperwork which takes valuable time away from those caring for the sick and injured. There must be a better way of doing things! Regrettably like, many disabled pensioners I have to make a number of visits each year and find the cost of parking unreasonable. I WOULD THINK THAT UNDER THE NEW SHREWD FINANCIAL MANAGEMENT OF MEDWAY HOSPITAL A REASONABLE INCOME IS SECURED FROM THE PARKING CONTRACTOR. HOWEVER I UNDERSTAND THAT HOSPITAL STAFF HAVE TO PAY FOR PARKING THEIR CARS, WHICH PERHAPS OUGHT TO BE REVIEWED. Well as for myself,I can only say that Medway maritime have done me proud but maybe I am just one of the lucky ones. Yes I aggree that drunks should pay for there treatment because it is self inflickted, but so are many others such as being over wieght resulting in many health problems, so were do we draw the line ? Trev, Perhaps drug and alcohol related treatment should be paid for as these are self inflicted. Being overweight is a health issue that is not necessarily volountary. Parking charges should be reasonable if a charge is to be made at all as nobody goes to hospital for pleasure but as a patient or relative visiting one. Staff should not pay anything. I would advocate having the Matron back as they kept everyone on their toes and many factors especially cleanliness would be addressed.